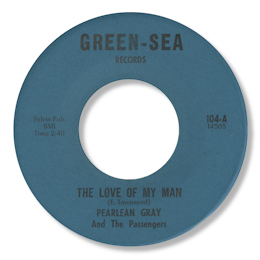 It is usually understood that Pearlean Gray and her Passengers were from Hartford, CT as that is where the label and production company Green-Sea (or Green & Sea) were based. I’ve got no reason to doubt this supposition. They only made three 45s but each one contained a real gem. The first was their version of Ed Townsend’s immortal For Your Love. 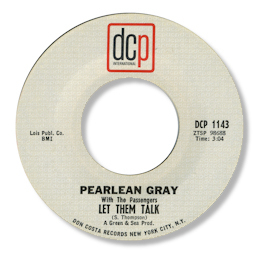 Pearlean shows off the flexibility of her voice here – no gospel tricks just a firm, straight doo wop styled performance but her tone is lovely and her sense of timing impeccable. Gray’s second 45 included a cut of Sonny Thompson’s Let Them Talk and this one, like her other ones, is beautifully handled. I’m very impressed too with her cover of that other Ed Townsend evergreen The Love Of My Man. This cut is best associated with Theola Kilgore’s superb rendition for Serock, but Pearlean certainly runs her close with her highly impassioned vocal. Strong arrangement too from the small band of musicians behind her. UPDATE ~ I'm delighted to sat that Pearlean's daughter Abraxas has been on touch to say that "It feels good to hear the things that you and others say when speaking about her. I also just want to let you know that she is alive and well. Still singing as we all know more beautiful then ever before. She sing gospel. Hope that others like myself find this page and know and learn that she is still alive and kicking. Thank you so much for the acknowledgement." Excellent news and so kind of Abraxas to write. NEW UPDATE ~ You can find a very interesting interview with Pearlean here. It is very good to know that she is still very interested in music, gospel of course, and fit and well now after a severe illness many years ago. Note ~ "The love of my man" can be found on the Ace UK CD "Dave Godin's Deep Soul Treasures Vol 1".